Basic Beekeeping: Lesson Eighteen: How Many Hives Should You Start With? Lesson Eighteen: How Many Hives Should You Start With? Here at Long Lane Honey Bee Farms, we are committed to help you be a successful beekeeper. David is a certified master beekeeper. We are offering 2 days of Queen Rearing classes June 27-28, and two Basic Beekeeping courses Oct 4 and Oct 25. Click here for more information. Hello from Long Lane Honey Bee Farms, and greetings from David & Sheri! This is the time of the year when our family celebrates the birth of Jesus, and enjoys time with relatives. Not to mention it's also the time of the year I eat too much homemade yummies! So Merry Christmas from our family to you. I haven't heard a peep out of my bees. 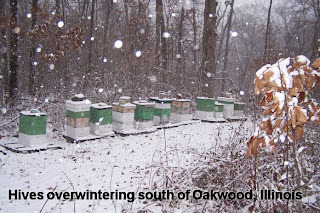 In fact, their hives are all covered with snow. Take a look at the picture below of some of my hives. I took this picture Saturday. You can click on the picture to see a larger version. Isn't that pretty? I think you can right click on the picture and save it to your computer and make it your desktop background image! You might be wondering about my entrances being glogged with snow. Normally, I would clear them after each snow. However, since I use screen bottom boards, I don't worry about ventilation through the entrance. But, I will need to clear it out before the next warm day when the bees will want to take a potty break. I like it when it get's cold like this because it keeps my bees in a warm tight cluster, not eating much. If we have warm winters, they can get more active and eat more. I'm often guilty of taking off more honey than I should have, cutting the bees pretty close on winter reserves. Now for today's lesson! How many hives should you start with? When getting started in beekeeping, a common question is, "How many hives should I start with?" Many people who are first starting out wonder if they can handle more than one hive. They rationalize that if beekeeping doesn't work out, then it is easier to get out of it with only one hive. Let me tell you what my opinion is on how many hives to begin beekeeping. Keep in mind that colonies of honeybees can and do sometimes die out even after we do everything right. I call it a natural death. If you have only one hive, and it goes wrong, then you don't have any hives left! With a few hives, two or more, you're always able to compare hives and keep going even though you might lose one along the way. Click here to see our two hive discount. I'm not ashamed to admit it that I've lost a few hives due to my own neglect or mismanagement. I'm just thankful I had a bunch of other hives to do it right with after I learned from my mistakes. This is why it is better to start with multiple hives than just one. When people ask me how many should they start with, I usually tell them, "As many as you can afford". Many people who start with one or two usually call back and order more the next year. For those who truly enjoy beekeeping, they are always seeking ways to add more hives to their apiary. I realize that available space and time has to be considered. However, there is always a way to gain more places to place bees without having to buy land. Many farmers and land owners will gladly let you place your bees on their property for nothing more than a few jars of honey in return. The average backyard hobbyist should always start with 2 or more. Why? With two hives, you can compare the hives to each other. Usually if both hives are acting the same way, it is a normal bee "thing". If one colony loses its queen, then you can place a frame of brood with 1-3 day old eggs from the other hive into your queenless hive and they will raise their own. And if one colony becomes weak, you can equalize the two hives by adding more bees to the weaker hive. With one hive these management practices are not possible. If I get more than one hive, will it require a lot of time? How much time you dedicate to beekeeping is entirely up to you. The extemes are, you can do nothing more than install your package in the Spring and do nothing at all, to the other extreme of inspecting your hives every two weeks. A good management practice is to inspect you hives every two weeks. This should only take about 15 minutes per hive. So for two hives, that's only a hour a month. But, here's how it really works for a lot of folks just getting started in beekeeping. They love it so much, they are always in the hive, looking at it, pulling frames out and showing friends and realtives. I opened one hive 5 times in one day show interested people the inside of a hive. It does disrupt their activities, so it is best to limit your inspections to twice a month, but some new beekeepers can't stay out of the hive, because it is so much fun. And the distruption is worth the experience you get by opening up the hive. With the more hives you have, the more you can inspect different hives and enjoy your hobby more. I once had a real nice motorcycle the kind you have to polished after every ride. I spent less time keeping 100 hives than keeping that motorcycle waxed! It really is manageable. With several hives, will the bees from one hive be confused and not know which is their hive?Will the hives fight each other? Bees keep to themselves pretty well. Each hive has a unique smell, to the bees, not to us. They will not bother other hives. As you can see by the snow picture above, I try to keep about 6-8 inches between my hives so that on windy days, they don't drift into the wrong box. Even if a few do, it is not a big deal. Will they fight each other? No. They keep to their own business. In the fall, during a dearth of nectar, a very strong hive might try to rob a very weak hive. But through proper management this will not be an issue. Proper management means keeping hives equal and avoiding attracting bees to another hive by mishandling honey or honey supers in the weak hive. Don't work a weak hive for very long in late summer or early fall. How close together can I place multiple hives? I've had hives on pollination pallets which were only 3/4" a part from each other, 4 hives on a pallet. But I think 6 - 8 inches is a minimal. And if you have a bit more space, give them a foot or two. Don't place them too far a part or else you'll be walking too much to work them. I keep them close so I can go right down the line when I am working my hives. If you have more 4 or more, try to make a "U" shape bee yard, like a horseshoe shape apiary yard. This helps the bees identify their hive quickly and it provides a little wind break for landings and takeoffs. Can too many hives in one area deplete the available nectar source? I've heard people argue that too many hives in one area can cause a depletion in nectar in that area so that only the strong hives do well. That might be possible if you live in the middle of a desert with only a hand full of flowers within 12 miles. Most of us live in areas where there is plenty of nectar sources. Bees are sharp when it comes to finding nectar. Just like we are sharp in finding food when we are hungry. You know where some good restraunts are and if you don't you know how to go out looking for that perfect steak house. Bees are even better than we are at finding food. It is extremely important to remember that bees fly 2-3 miles out to gather nectar. I think some people think of bees as dogs, meaning that they think the bees will stay in their yard. Unless you have a huge yard, it aint' going to happen. Now, let's say you live in town and you own a regular lot where beekeeping is permissible. Your bees will fly 2 to 3 miles around searching for nectar. One of my bee yards is located just on the edge of a city of 10,000 people. The bees fly straight up and out and late this summer they brought in a lot of alfalfa honey. They weren't getting this in town! Within a 2 mile radious there are over 8,000 acres. A 3 mile radius includes over 12,000 acres of nectar to choose from! Wow! Now, to better illustrate how much nectar is within a 3 mile radius, I've taken a satelite image of my home where I have about 30 hives. I have superimposed a circle that represents a 3 mile radius. Look at how much land that emcompasses. Even though I'm about 4-5 miles away from some towns near me, it's only about 3 miles the way the bee flies. And if you notice near the top of the picture, there is a large river that runs through the 3 mile radius which means lots of river bottom flowers even in dry weather. It just makes better practice to start with two or more hives. I started with one hive and through neglect it died off and since I had only one hive, I was out of beekeeping for several years. Now don't let me discourage you if you can only start with one hive. You can start with one and do great! You can add more and more hives as the years go by. And, your one hive may never die. Instead, you might get many splits from your first hive. You just never know. But, your chances of success are increased by the more hives you have. Thanks for dropping by and spending some time with me today, talking about beekeeping. It's lots of fun, isn't it! Feel free to email me some questions and I'll be happy to consider turning them into some future lessons! Together we're all learning so much! You can order directly from us, at 217-427-2678! See ya next time and remember to BEE-Have yourself! I have just begun going through every one of your posts. As a second year beekeeper I heartily admit it has been a pleasure. The best number of hives for the beginner may be found by consulting the local zoning ordinances at the City or County offices. Only two hives are allowed in Santa Cruz, CA, not that that has slowed down the neighbor who has four. We need the bees in our apple trees and love the golden streaks through the sky in the morning at breakfast against the sunrise. To start off, I want to thank you for all of your online lessons, I greatly appreciate it. I live in a mostly rural area, a typical Ohio farming community. I am 19 now and started keeping when I was 14. In a 20 mile radius, I only know of a few dozen "hobby" keepers, and finding new and innovative ideas are fairly hard to find around here. Without your help, I wouldn't be half the keeper I am today. Your knowledge is invaluable to me. I am hoping to join one of your scheduled 2013 classes this year to benefit even more. Am Joyce, Herpes wanted to destroy me, but with the help of Dr.Ekpiku i escaped the death that was on my way, i am here to testifies on how Dr Ekpiku help me to cure my sickness called Herpes which has been eating me up for 2 years and 4 months, i also saw online how he has cured so many people, Dr Ekpiku is a great herbalist that treats and cure all manner of diseases like Herpes, HIV, Cancer, Syphilis, Hepatitis B, all types of Cancer, Gonorrhea, and solves life's problems that you might have etc.. contact him today and he will help you solved your problem, contact him via ekpikuspelhomeofgrace@gmail.com or ekpikuspelhomeofgrace@hotmail.com call +2348073673757 OR whatsapp him. THESE ARE THE THINGS Dr. Ekpiku. HERPES. HIV/AIDS. CANCER. 2 mile radius is 8042 acres. A 3 mile radius is over 18,000 acres. I got my first hive when I was 23, but ended up moving and leaving it behind. My next hive came 10 years later and only lasted 3 years. My home is at 9000 feet and the winters can be extremely cold. I suspect they starved. I wish there had been a resource like your web site back then. I just built 3 hives for the packages that will arrive at the end of this month. I have learned so much from reading your lessons and from other sources. Hi Everyone here in this forum, I am here to share with you all about how Dr OBULU who was able to cure me from HIV with his Herbal Medicine, Been with HIV is something someone is never comfortable with, I was tested and confirmed HIV positive few years ago and i was taking medical treatment from my Doctor, some time back now while i was on the Internet i saw different amazing testimonies concerning Dr OBULU on how he has healed people from various sickness, someone also testified about how he was cured from Diabetics with the Help of Dr OBULU Herbal Herbs Medicine, they gave his personal information and advice anyone to contact him that he also help in all kinds of STD Diseases if you need his help, i took the email address of Dr OBULU and i sent him a message regarding my Problem and how he could possibly help me out, He responded to me and told me to have the faith and believe in God, Dr OBULU told me that he was going to prepare some Herbs for me which i am to take for some time as my medication, he told me the procedures and i agreed to it, after some days of communicating with Dr OBULU he actually sent me a package and he gave me the tracking number to my package, he gave me prescription on how i am to use the Medicine,after taking Dr OBULU Herbal Medicine i went back to my Doctor for another test and to my greatest surprise my result turned out Negative, and i still did not believed it i went to other hospitals for another test and the result still remain Negative, today i am so happy and living with my family as my health is back again, you can reach Dr OBULU for any problem or sickness his Herbal Medicine has it all as your solution, reach him on (DROBULUSOULTIONHOME@gmail.com) or call his telephone number Or whats-app +2349057519547 God Bless you Doc for your good Work in my Life.